SEOUL, Nov. 28 (Yonhap) — The 2019 Korea Baseball Organization (KBO) season will have the earliest start in the league’s history. The KBO announced the schedule for its 38th regular season on Wednesday, with 10 clubs each set to play 144 games. The 2019 season will begin on March 23, which will be the earliest start to a season by one day. This year, the regular season started on March 24, in order to accommodate a three-week mid-season break during the Asian Games. The late start resulted in the latest conclusion to a season, as the SK Wyverns captured the Korean Series title by beating the Doosan Bears in Game 6 on Nov. 12. Without any in-season interruption in 2019, the league champions next year will be determined in October. The KBO said the top five teams from the 2017 season will host the Opening Day games. The Bears will host the Hanwha Eagles in Seoul. The Lotte Giants will bring the Heroes — a club formerly known as the Nexen Heroes, which will have a new title sponsor in Kiwoom Securities next season — to Busan, 450 kilometers southeast of Seoul. The Wyverns will face the KT Wiz in Incheon, just west of the capital, while the Kia Tigers will host the LG Twins in Gwangju, 330 kilometers south of Seoul. 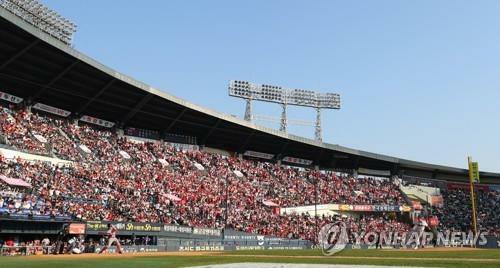 The NC Dinos will take on the Samsung Lions in their new ball park in Changwon, 450 kilometers southeast of Seoul. Games that are canceled due to rain or other inclement conditions will be made up starting on Sept. 14. The KBO will also extend the All-Star break from four days to seven days. It will run from July 19 to 25 next year.